I am a sucker for potatoes. I don’t care what kind they are or how they are cooked, I just love them. I’m always looking for new ways to sneak potatoes in that are also healthy. 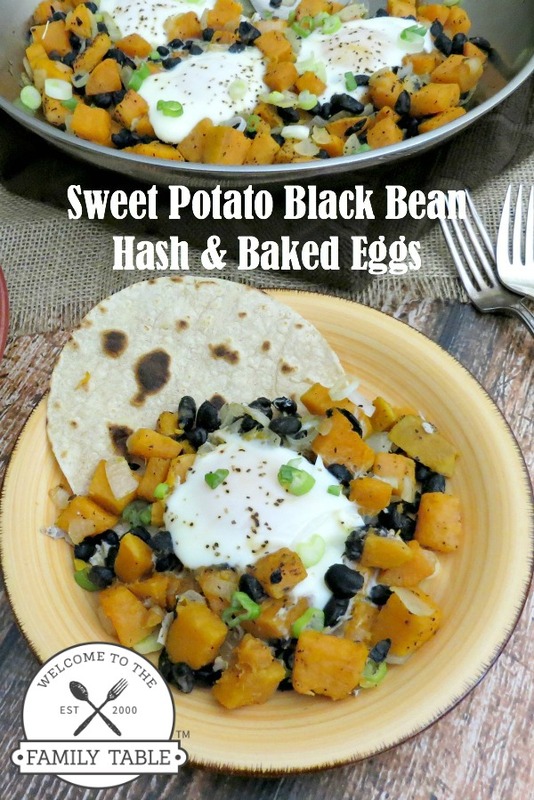 I really enjoy making this sweet potato black bean hash with baked eggs as it is not only healthy, but also delicious and hearty. 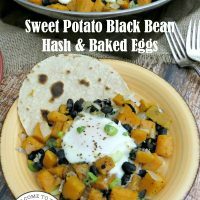 This is the perfect remedy to the “boring breakfast” club and is great for brunches and even dinner! Give it a try the next time you want some potatoes, I think you’ll be quite pleased you did! This delicious meal will treat anyone right! Can be served for breakfast, lunch, or dinner! Add the sweet potato, onion and 1/4 teaspoon each salt and pepper and stir to combine. Cover and cook for approximately 15 minutes, stirring frequently. If it appears to cooking too hot, turn the heat down. After 15 minutes, remove the cover and continue cooking until the sweet potatoes are tender. Add the black beans and most of the green onions, reserving some for garnish. Stir to combine. Let cook for 2-3 minutes or until heated through. Use a spoon to make a shallow well where you want to place each egg. Carefully crack one egg into each well, being careful not to let it spread out too much. Sprinkle the remaining 1/4 salt and pepper over the eggs. Place the whole pan in the oven for approximately 10 minutes or until the eggs are cooked to your liking. Serve immediately with extra green onion sprinkled on top, hot sauce or sour cream. You can eat this as-is or serve it with toasted tortillas, which is what we do!